You've heard it before: people make purchase decisions emotionally and justify them logically. So, the logic goes that your sales materials should appeal to their emotions, and then back your offer up with logic. 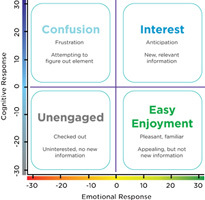 ... Emsense has created a four-quadrant matrix [which] plots what they call emotional and cognitive response. Low levels of both indicate lack of engagement ... the sweet spot is the combination of low cognition and high emotion (dubbed "Easy Enjoyment"). The research studied packaging, and found that the best response comes from engaging emotionally, while triggering as little logic as possible. Why does that work? Think about what you do at the grocery store. You walk up and down the aisles, pulling things off the shelf and dropping them in your cart. Which is the most likely to find it's way into your cart and stay there -- a package with a delicious looking cookie on it, or one with a delicious looking cookie and a 10 point bullet list of reasons why this cookie is the one for you? What if points 2 and 5 reveal things you don't like in a cookie? -- it's chewy instead of crunchy, they used dark chocolate chips instead of milk... They may even be things you do like, but aren't in the mood for today. The more you think about it, the less likely you are to buy. Is What's Good for Packaging Good for Other Sales Materials? Are copywriting gurus wrong when they recommend backing up your emotional appeals with logic? No. But you might consider adjusting your approach a little. First, when you tell your stories (a good emotional device), make it easy to draw conclusions from them. Don't just tell a feel-good story that requires a lot of explanation to connect it to your product. Second, don't over-explain after the story's over. If the story has done its job, the customer will have made the connection. A quick note to solidify the idea should be plenty. Third, know what objections the customer is likely to have. Address those through emotionally engaging content, like stories, as much as possible. Fourth, if there are common objections that you can't address emotionally, don't draw undue attention to your heavier logical arguments. You might place a call to action (eg. a link to your order form) in the middle of your copy, above the appeals to logic to avoid losing people who are already sold and not thinking about the objections. You could even move the logical content off the main sales letter and just link to it. Fifth, don't spend too much time -- at least not in the main sales letter -- addressing objections that only a small minority of your target market has. Finally, particularly with products where you have no choice but to address lots of objections logically, try to get prospects to make small commitments (like joining your mailing list) based primarily on emotional appeals. Then use your follow up emails to address logical concerns (while continuing the emotional appeals). That way, you won't have to get them past all the logical barriers at once with a single make-or-break pitch. One more tip I neglected to mention: be careful that your emotional appeals don't set off the customer's "BS-O-Meter". Your stories need to be credible (and true). If they're not, your prospects will switch over into logical mode, argue with you in their own heads, and reject your pitch. And one last point: the goal (if you're ethical) isn't to hype your product and get people to buy whether they need it or not. The goal is to illustrate the real benefits of the product without triggering a lot of self-talk that results in your prospects talking themselves out of buying something that would really benefit them. With any persuasive technique, there's a fine line between ethically helping people overcome their own doubts and fears and manipulation. Antone said "there's a fine line between ethically helping people overcome their own doubts and fears and manipulation". That fine line get finer every day and takes a longer balance bar to stay the line.